Yoshi was originally released as a sidekick to Mario in Super Mario World for the SNES. Since then he has become a pillar of the Nintendo world. His first run as the main character in a game was in Super Mario World 2: Yoshi’s Island. This game was released later on in the life of the Super Nintendo and is regarded by some as one of the best platform games ever made. Yoshi’s New Island is no slouch either. We thoroughly enjoyed every minute that we played it. The best part of the experience was that all of us (including my six year old) were able to play the game without some of the usual struggles that come with platformers. That isnʼt to say that that mastering Yoshi’s New Island was easy (far from it), but even the youngest among us could progress through levels without frustration. 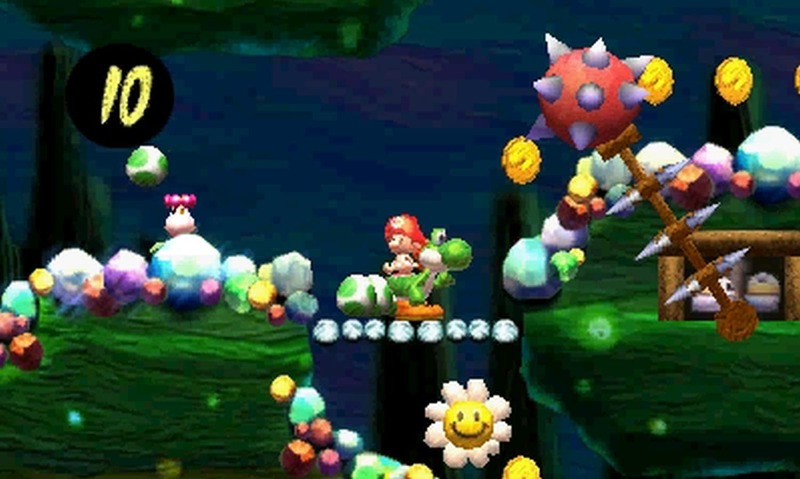 The real challenges came in the form of boss fights that require precise use of Yoshi’s egg tossing ability. Triggering the ability causes a red x to wave up and down in the direction that Yoshi is facing. It is important to be careful with your timing to make sure you egg tflies in the correct direction. All mechanics aside, Yoshi’s New Island is a gorgeous game. It is done entirely with a crayon-drawn aesthetic that is more adorable than can be expressed in simple screenshots. Yoshi’s New Island has the standard level of Super Mario “violence.” There really isnʼt any. There is nothing to be concerned about here. When you combine that with the crayon-drawn art style this game is aesthetically targeted towards younger kids. There are two main components to discuss here regarding the controls. First, it follows the standard 2D platform tropes with regards to controls. You use the directional pad to move left left to right and the B button to jump across pits and up to high platforms. This is not a terribly difficult game to complete, but many of its secrets will be difficult for new players to accomplish. This is, however, a great game for new players to cut their teeth with. Yoshi’s New Island is a must own game for parents with younger or inexperienced gamers. It is not without its challenges, but this is an excellent introduction to the platforming genre. Episode 163: Apex Legends Comes Out of Nowhere! The Nintendo 3DS Still Has Life Left!